Over the last several years, as many hospitals and health systems across the country were building patient towers for their acute-care needs, David Lopez, the outgoing CEO of Harris Health System in Houston, was quietly shifting his organization in anticipation of some of the changes that the Affordable Care Act has brought. He didn’t expect more revenues from inpatient services; he worked to build a strong wellness program and to ramp up primary care heavily. There’s a reason for that. Harris provides 35,000 admissions every year, but Lopez notes that outpatient visits have reached 1.4 million annually, with an additional increase of 300,000 expected in the next 18 months. As the leader of one of the largest public health systems in the country, Lopez was used to having to deal with funding that wasn’t always available, as well as the transparency and scrutiny that comes with public governance. A couple years ago, Harris County took a penny from the hospital district’s tax rate to cover some of their expenses. The health system hasn’t gotten that penny back and, with the district’s population growing by 100,000 people a year (“the unincorporated areas have a population larger than the city of Philadelphia,” Lopez notes), it’s a struggle to have a break-even budget. 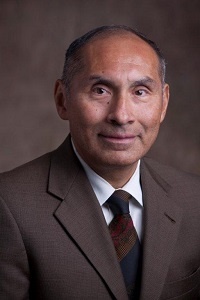 Despite the challenges, Lopez’s respected work earned him an award as one of Modern Healthcare’s Top 25 Minority Executives of the Year for 2014. John Guest, his predecessor at Harris, noted that Lopez “has the patience of Job,” a quality that was needed as Lopez and his staff worked to revamp the system so it would be less impacted by uninsured patients. In Lopez’s case, the focus was lessening the pressure on the emergency department by transforming the safety-net system into one more reliant on primary-care clinics. Wellness is part of that strategy and something Lopez takes seriously. He’s been a runner for 40 years, and last year Harris ranked first among Houston’s largest employers for its wellness program. He says that, ultimately, Harris’ patients will need to do their part too. Such an approach, of course, requires foresight and patience. Lopez has plenty of both.